Friday the 5th of october 2018, a Banksy’s work of art has been sold for 1,2 million euros during an auction. I think you all heard the story but for those who did not, the painting got immediately shredded in front of everyone in the meeting. Banksy has a engaged art, I really like this and understand his act but I feel it became a bit too mediatized. 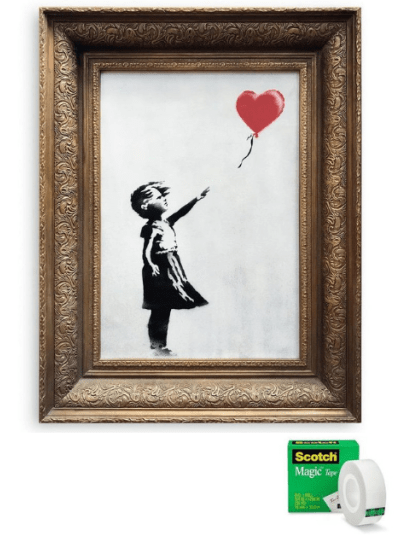 Besides this big buzz Banksy made and all the questions about selling art he created, I love how Scotch took advantage of the situation. A lot of brands took the opportunity but I feel like Scotch is the most efficient. It’s so simple but it makes you smile automatically. I appreciate the fact that if you don’t know anything about what happened you don’t understand the ad. As a conclusion I don’t know if Banksy is a genius or just a marketer on this case but it’s pretty fun to see how brand try to be creative about the trend.